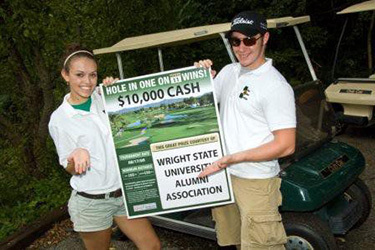 The Wright State University Alumni Association has many opportunities in which you may contribute. The strength and longevity of the Association is dependent on the assistance of its members. A few of the opportunities are listed below. Interested in volunteering? Fill out our volunteer interest form to get started. At all men's home basketball games, the Above the Rim Alumni Zone is open to all alumni, Green and Gold Level Alumni Association Members. Beverages are available to Gold Level Members at discounted prices and free snacks are provided. There are two alumni volunteers per game. Our annual events include the Annual Beer Tasting, Rowdy Gras, Dinner with 12 Raiders, the Annual Legacy Scholarship Golf Outing, Move-In Day, and Homecoming. The Alumni Association's career resources continue to grow. Help out your fellow Raiders in their career search. We have opportunities throughout the year for alumni speakers if you wish to share your experiences that way. The RaidR Network, or Raider Recruiters, is made up of alumni and/or parents who represent the university to prospective students through the Office of Undergraduate Admissions. Help grow your alma mater by sharing your experience, reaching out to potential future students and most of all, act as a resource for those around you. Wright State University Alumni Association will assist alumni special interest groups, alumni of student organizations, and alumni of Schools/Colleges and departments to host various affinity events and reunions. Help send off Wright State's graduating seniors in a memorable way! Prior to spring commencement, Senior Week is held annually by Alumni Relations. Events to get involved in are the Alumni and Senior mixer as well as the Alumni and Senior happy hour. During both spring and fall commencement the Alumni Association invites volunteers to come help greet graduates and pass out alumni gear such as lapel pins. Update your information to receive communications that keep you connected and inform you of opportunities in your area or back at the main campus. Follow us on social media to receive the most current, up-to-date news about Wright State and your Alumni Association. Visit our events calendar to see what events are coming up. There are events and opportunities for everyone to get involved in. Make a gift to a scholarship or fund of your choice from any department or academic area. A $50 gift earns you a Gold Alumni Association membership. Call the Office of Alumni Relations at (937) 775-2620 or email us at alumni@wright.edu if you need an alumni volunteer for your event!